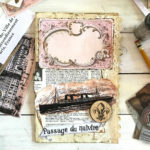 Welcome to our first Junk Journal page layouts and techniques of our ‘Vintage French Junk Journal’ journey. I am affectionately calling it J3 for Junk Journal Journey. The fact that you stepped into this Summer Project with me brings me great joy. My name is Rebecca E. Parsons, also known as Cre8tiva, and I am a life long ‘journaler.’ It’s one of many creative things I LOVE to do. If you missed the first tutorial in this series, I recommend that you work through it before attempting this tutorial. 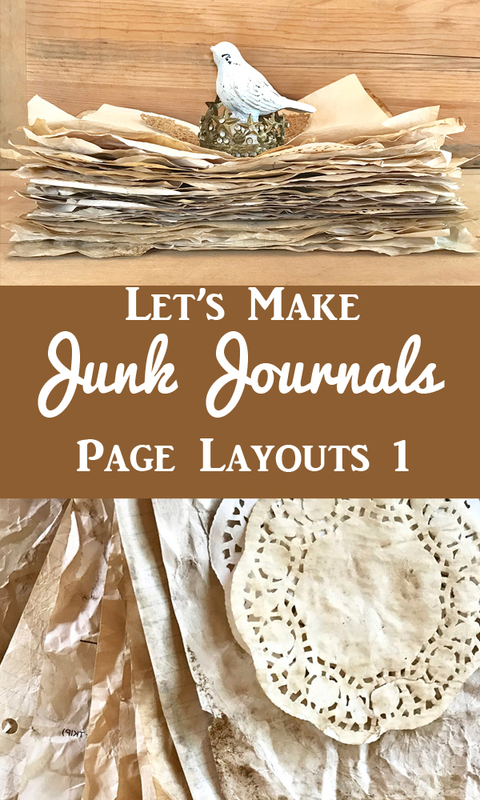 You can find it here –>>> The Junk Journal Introductory Tutorial. As we begin to decorate our pages, please know there is no right or wrong way to create a junk journal. There are numerous, amazingly beautiful ways to do this. It is an entirely personal journey just for YOU unless, of course, you want to share your work with us or on social media. 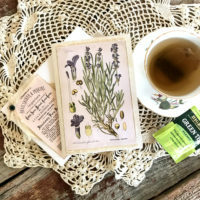 My greatest hope is that you will make it your own and discover some new ‘vintagey’ techniques that you love along the way. 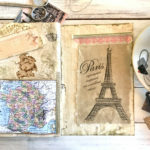 With all that out of the way let’s dive right in, begin to explore France through The Graphics Fairy archives, and take a look at the layouts I will be sharing in the Page Layouts 1 tutorial. Before we get started, let’s talk a little bit about some of the basic supplies you’ll want to have on hand to get started. You probably have them in your craft stash anyway. I am a paper artist/crafter/book maker at heart, and my supply cabinets reflect this. 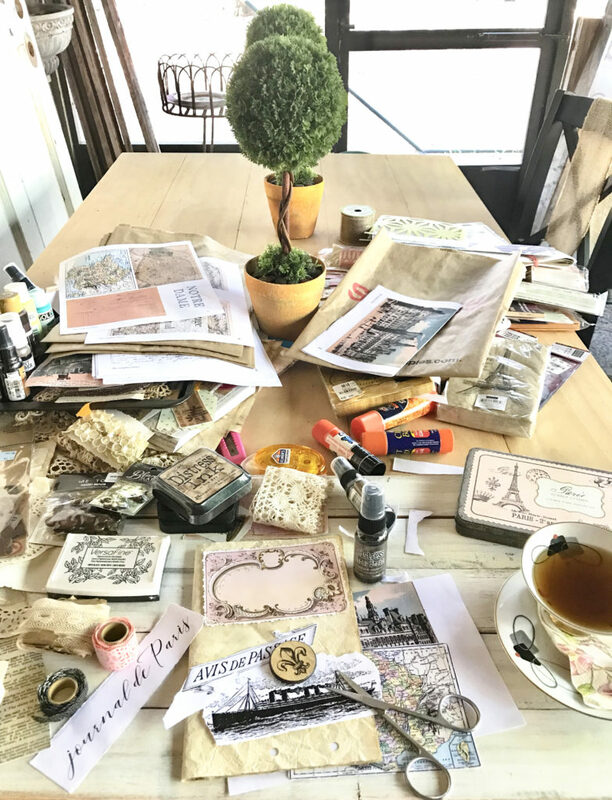 Almost everything I use is something I have in my stash for journaling, planning, bookmaking, or collaging! The Graphics Fairy images and ephemera. We have that covered. WINK WINK! 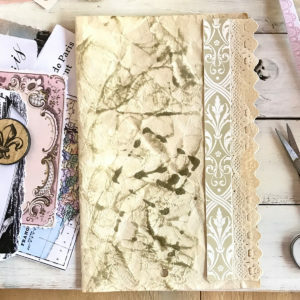 Lots of flat, ‘vintagy’ stuff like scrapbook paper/cardstock, die-cuts, stickers, labels, tags, and washi tapes to elevate and enhance your layouts while they don’t add too much bulk to your pages. 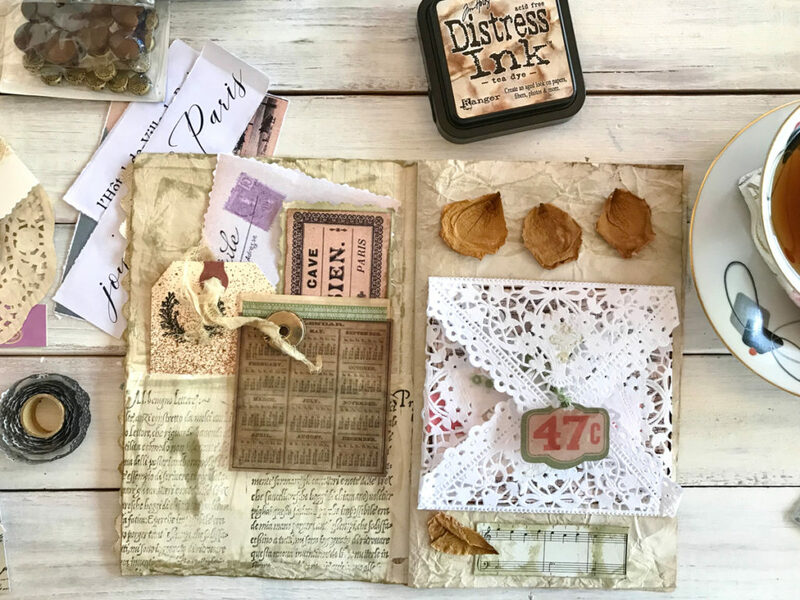 The paper supplies you enjoy in paper crafting translate perfectly into junk journaling. 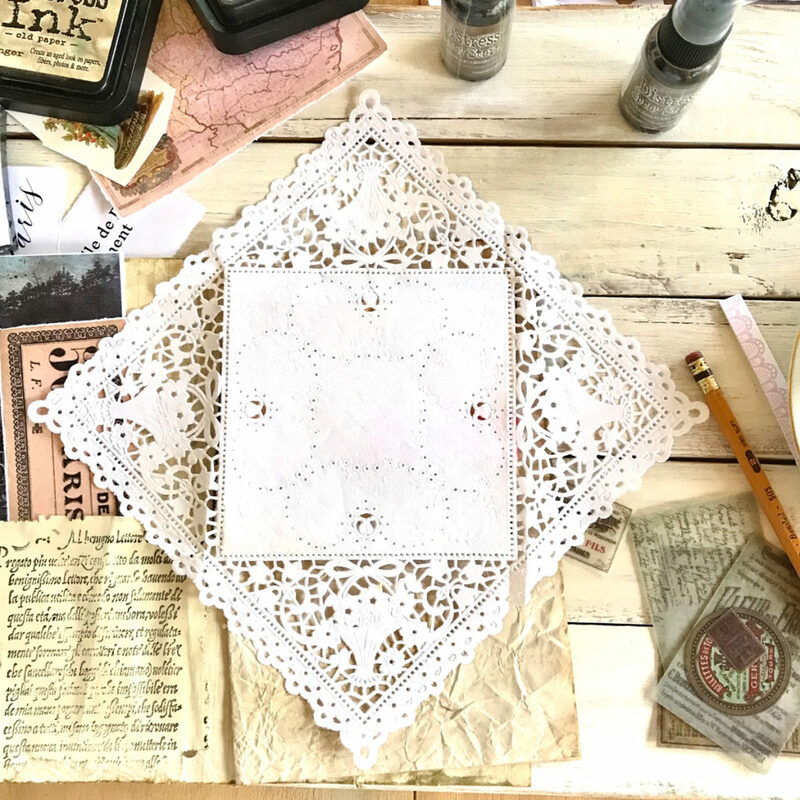 Tea stained doilies and index cards, and used tea bag papers. 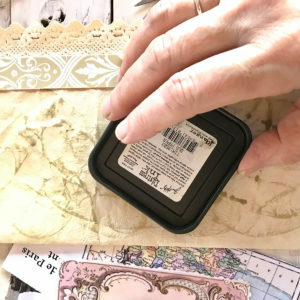 Rubber stamps and stencils for adding interest to your pages. Plus, they are reusable! Stamp ink, markers, watercolors, and highlighters for adding color to your pages. Scrapbook flowers, buttons, embellishments, and other ‘little somethings’ that bring your design to life while adding depth, color, and your mark of creativity to make them ‘your’ pages. Mica windows – I have a 100 pound bag I am whittling down. Metal and Wood Embellishments to give more dimension. Fabrics, leather scraps, and tea stained ribbon. Tabs, envelopes, frames, labels, and napkins. 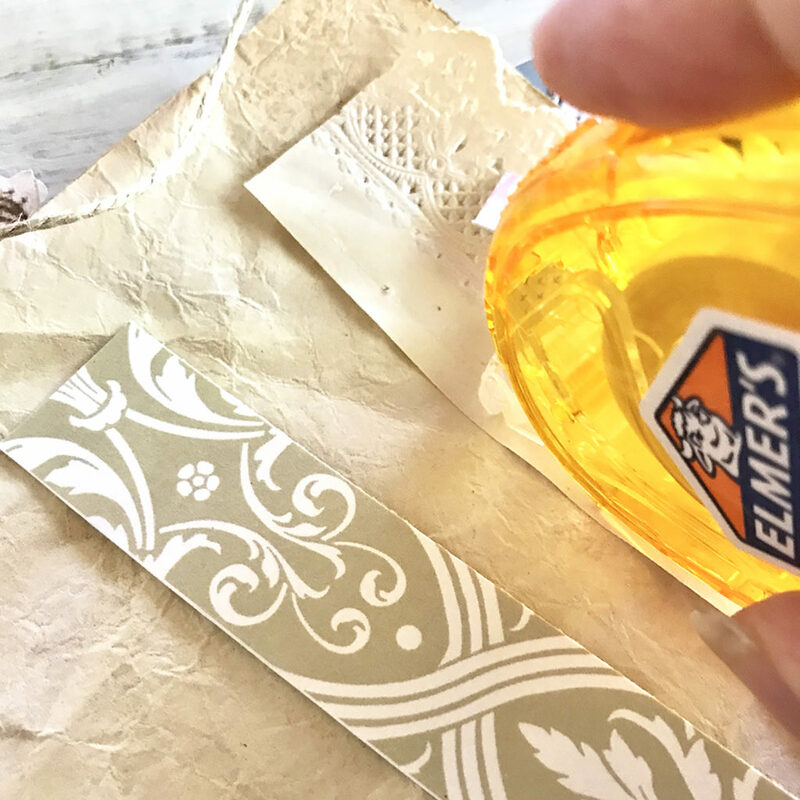 Adhesives to attach things to your pages. Elements from Nature–leaves, dried flowers, twigs, and bark. 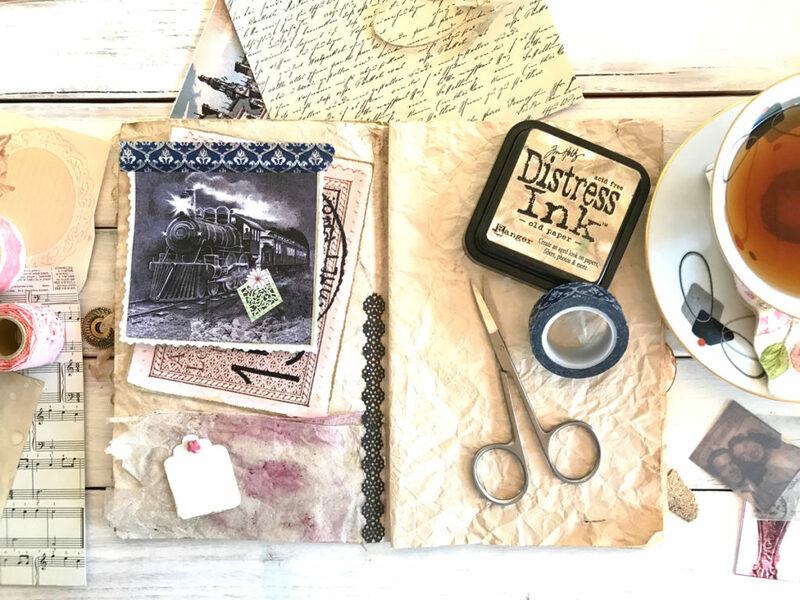 As you journal more, you will find a few supplies become your favorites. My advice is to buy those in bulk so you always have them on hand. Grow into the tools, supplies, and products that work best for you. Your very own style will begin to emerge the more you play and create. Stay true to you and your style as we move through the series. If you are more of a primary color person, feel free to use those. If you are a black and white lover, go for it. There is no ‘right’ way. If you have a bleed-through from other pages, embrace it. I am sure we will learn to cover things up as we work through our pages. Please note that some of the images I chose for this tutorial are from the older archives (back when Karen started out) and not as large or as high-res as more recent TGF images. 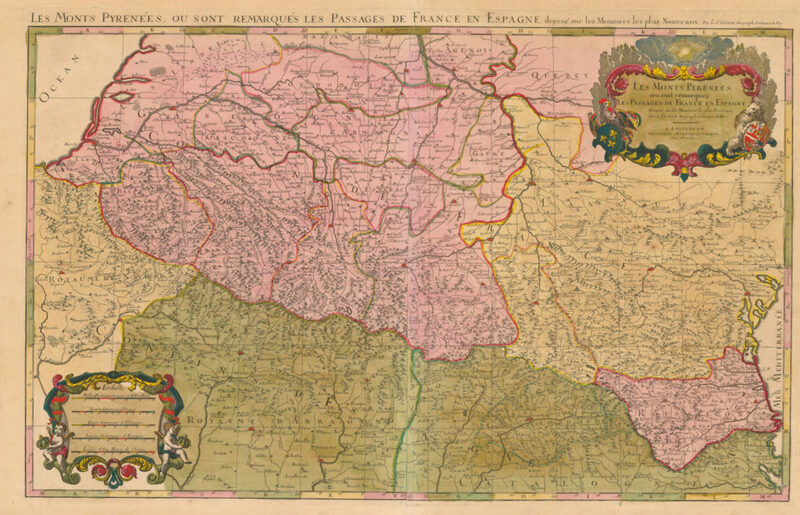 The map image that inspired the color palette of this book is the map below. Nonetheless, it inspired me, and my rustic style embraces it. Please feel free to use a different map that suits your style more closely. Anything goes in this series. My Style/Your Style…We All have One! What’s yours? 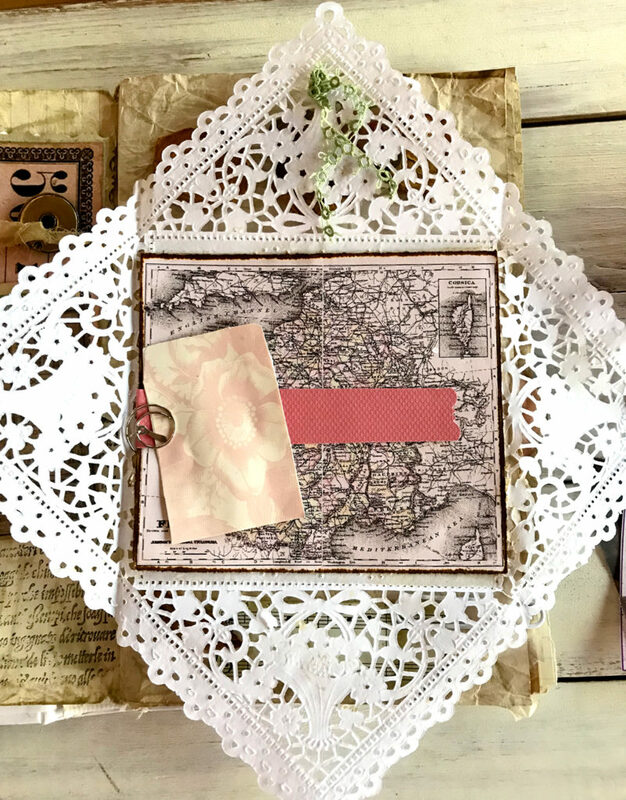 Over the years I have developed a vintage/rustic style, which you will discover in the look and feel of our project pages. Every once in a while I stretch my comfort zone and try different color palettes or a new product. But my style usually shines through. I also love to tell a Story with my junk journals. 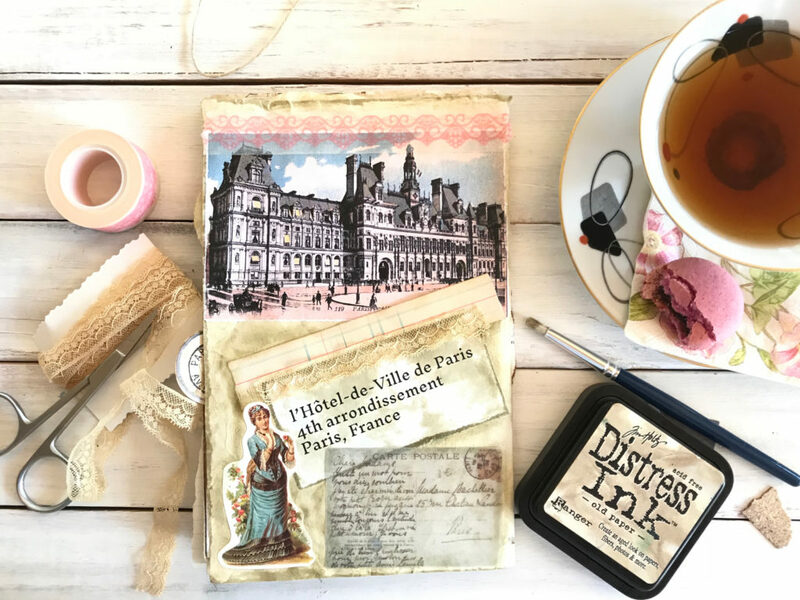 Our story for this series is a young woman who travels to France in the 1890s. She wants to remember every detail of her Summer abroad. 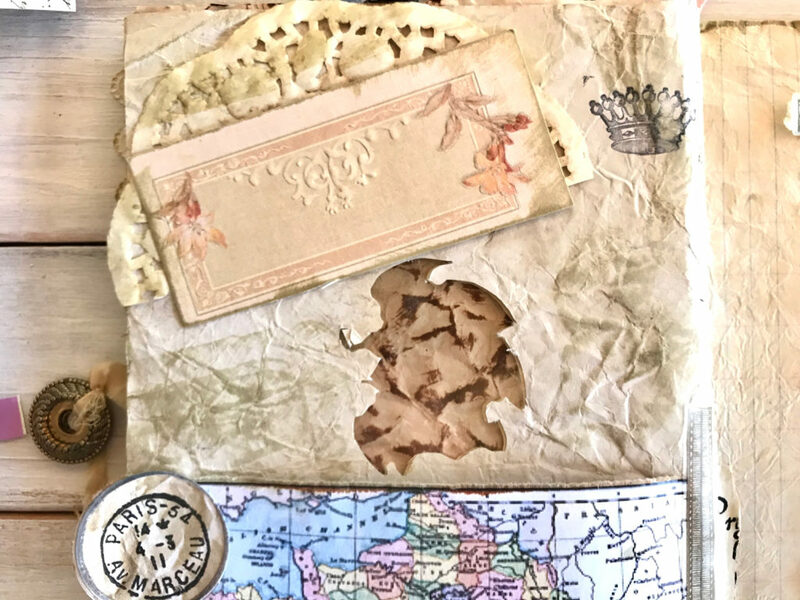 She collects bits and trinkets and gathers them into a travel journal. That is where the fun begins. Holding it together while we work on the pages is always an issue. Some people let them stay loose. 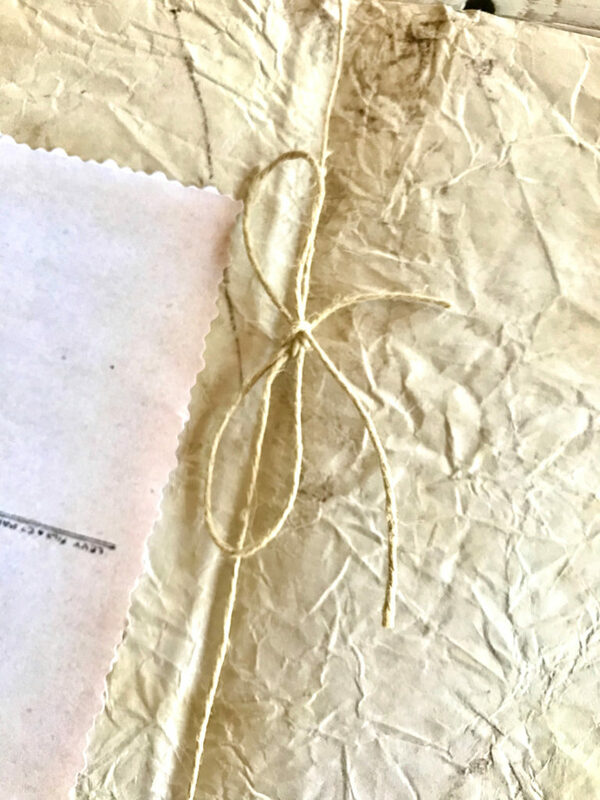 I prefer to create a temporary binding for the signature. I like to use elastic cord or even a scrunchie headband. In a pinch any ribbon or cord will do. Just don’t make it too tight so the pages tear at the center. I like it loose enough to be able to remove pages and add them back. I will do that several times while working on layouts. I like to see pages beside each other as I work. But you can feel free to work as you like. We have to bring our Graphics Fairy images off the screen and separated from the paper for journaling. I print my images on a laser printer at Staples. 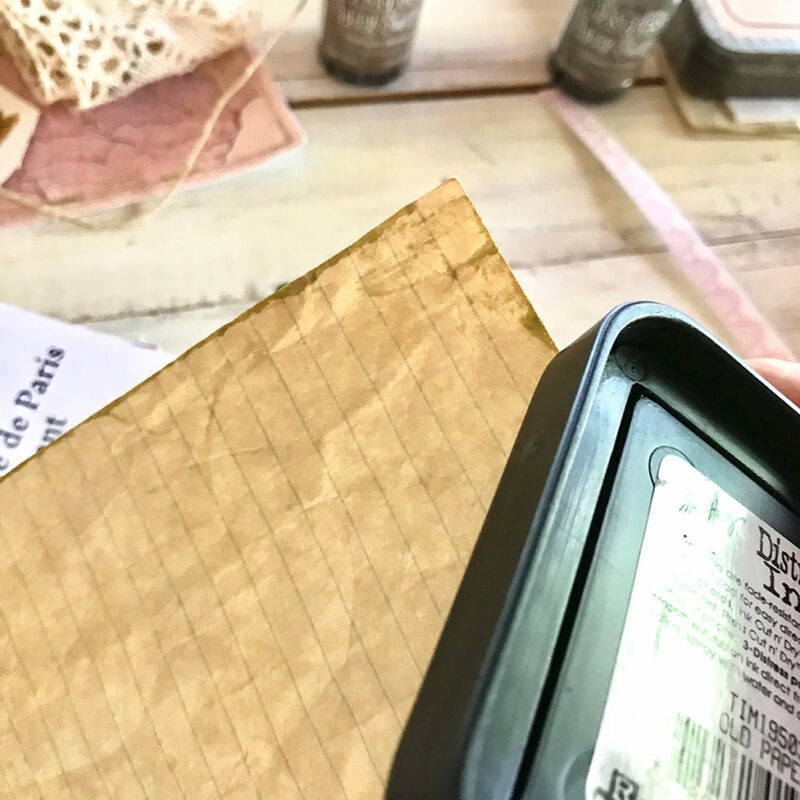 You can use any printing device you have, just make sure your images are properly sealed as we will be painting, inking, and/or gluing them. Some of my images will be fussy cut (left image below). 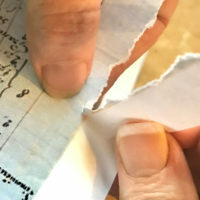 That means cut around the outline of the image with scissors. I am not that fussy, but my best tip is to have a small pair of scissors that fit your fingers comfortably and move the paper leaving the scissors stationary. I prefer to tear images like in the second photo below. To tear straight lines, I fold the paper along the straight edge, wet the edge on the front, fold it to the back and wet again. I usually lick it, but you can use a damp sponge if that turns you off. Then lay it flat and pull the paper being removed back over itself toward you (right image below). Remember that I crumpled my pages when I stained them so they have a hand (feel). One of my very favorite aging techniques is rubbing an ink pad ever so lightly over the paper. The ink catches on the ridges and darkens them leaving a lovely aged effect. I used Distress Ink Old Paper for this page. It gives a lovely greenish-gray hue that matches our palette for this book. I use the same ink to age the edges of almost everything. I just rub the ink pad over the edges and smear some sometimes. You can use a pad made for this if you have one. I will be doing a lot of lettering throughout this series. Some of it will be done during the final touches portion of the series. Some will be hand lettering and some will be stenciled, stamped, or stickers as you see below. My tip for lettering is to begin in the middle and work out in both directions. I like repositionable stickers because I can’t ever seem to hit the right position my first try. 🙂 If you can make a practice piece first, that helps. The message on my banner means ‘ship passage’ in French (I hope). 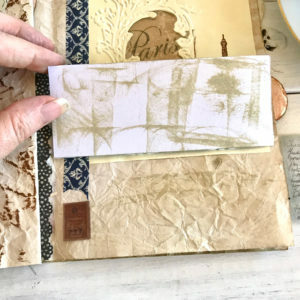 This technique is super easy, yet stunningly beautiful in a junk journal. Seriously, the hardest part is finding a square doily! TEE HEE! 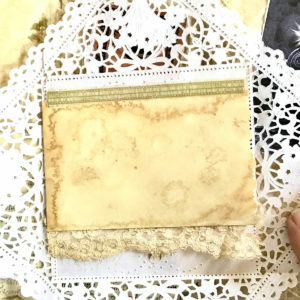 Just attach a square doily to a journal page (I used glue stick) as shown below. Fold each of the points in toward the center. 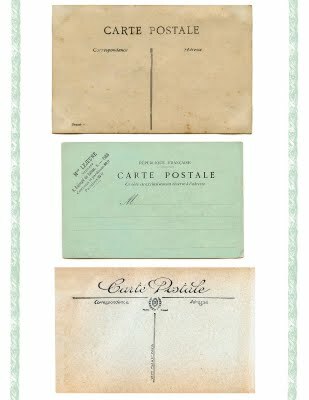 And presto…an envelope to store some trinket or ephemera. 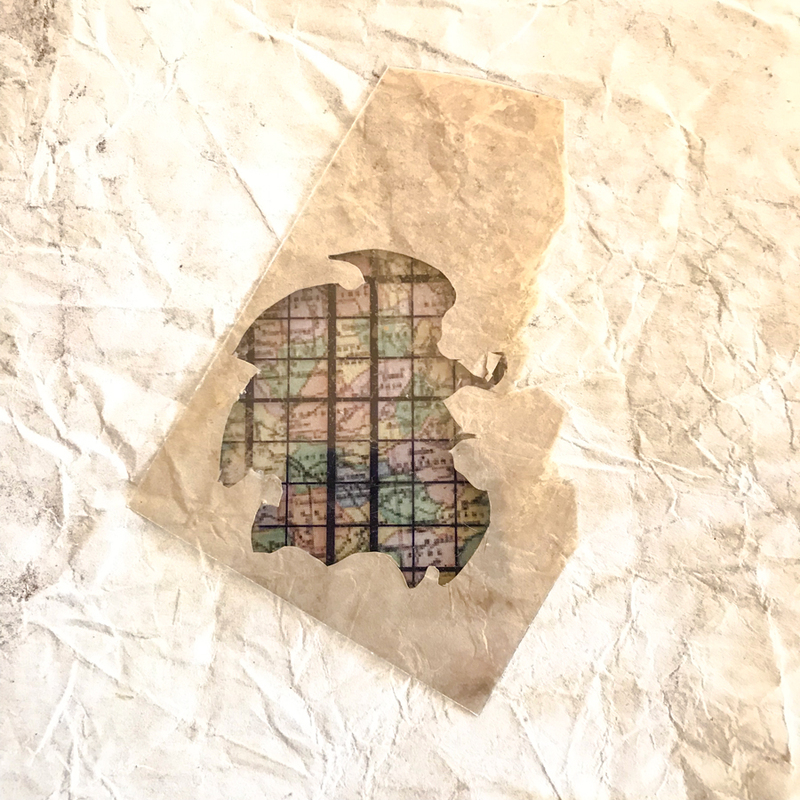 I used it to hide a map of France and a journaling square. 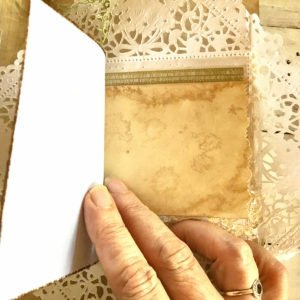 I attached some tea-stained lace to the back of a tea-stained index card cut to fit inside the doily. I attached it with a piece of washi tape. It is free for journaling. I used a dusty green shade. 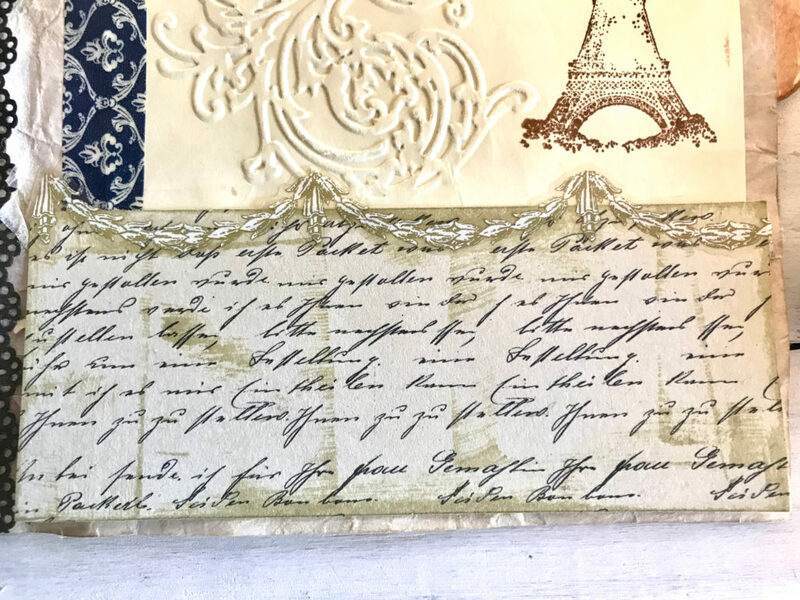 I then attached a map of France over the index card with washi. 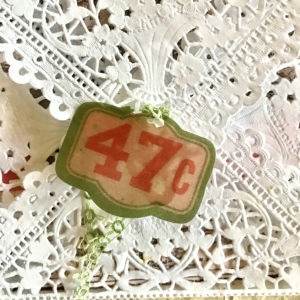 I folded the envelope and added a 47¢ tag with some died green lace. Here is how it looks when finished. I will show you the button envelope next. I always save button envelopes to use in my books. 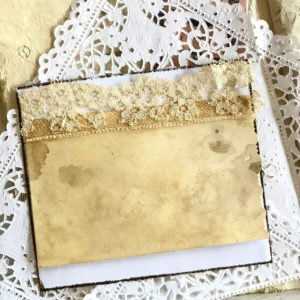 It is great for junk journals. I cover them with a scrap of scrapbook paper from my stash. I love to discover great new uses for throw away items. See the finished envelope attached to the map with a wire paper clip in the above step. 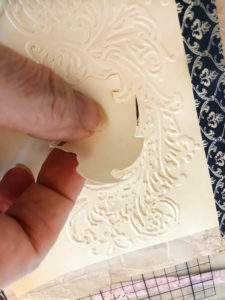 I embossed an image with a cartouche (label) opening several years ago. I pulled it from my stash for the J3. 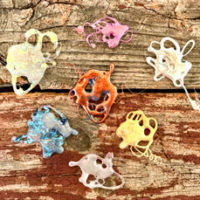 It reminds me of Karen’s ornaments. I thought the label area would make a great window page for the journal. I attached it to the page with washi on both sides. I did not want it to move as I cut. I needed to cut through the embossed card and the journal page both. 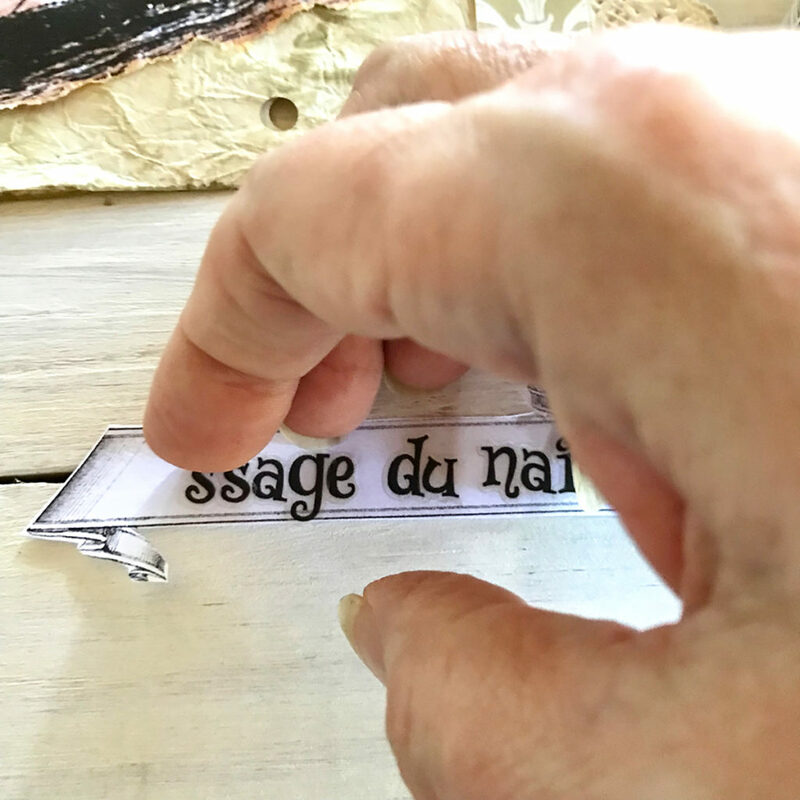 I placed a small glass mat beneath the pages and used a Swivel Tip Craft Knife. Be sure to cut it out carefully…and slowly. It takes time to get in the tiny places and around the curves, but this knife makes it fairly easy. Remove the cutout carefully also. If it is still stuck in some places, you can use your fussy cutting scissors or the knife. This is the opposite side with a map from TGF and a little card from my stash. 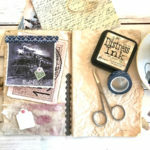 I love hiding several places for journaling when I create these. I found this swag sticker on an old sticker sheet from Anna Griffin. It worked beautifully. 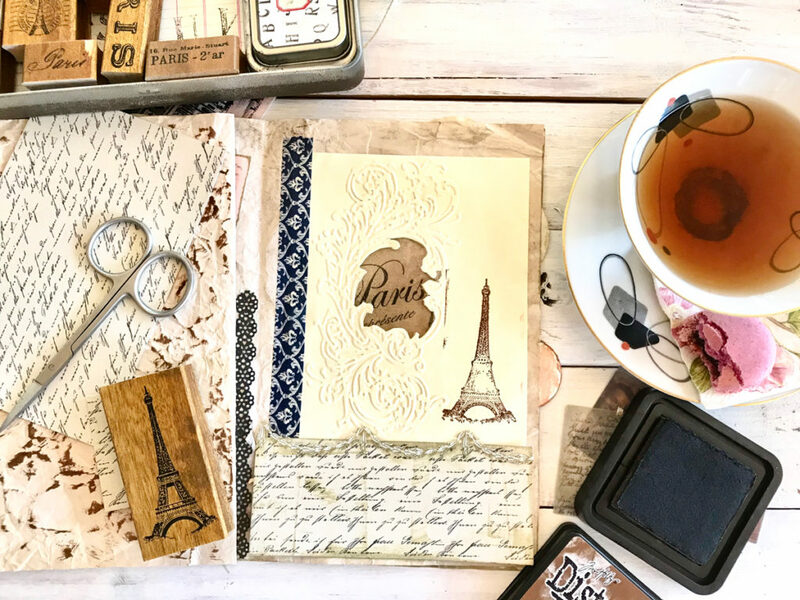 Don’t be afraid to try something out of the box as you junk journal! You can see the journaling area below right. I love stamp ink for shading around images and bits and pieces of my layout to add depth. 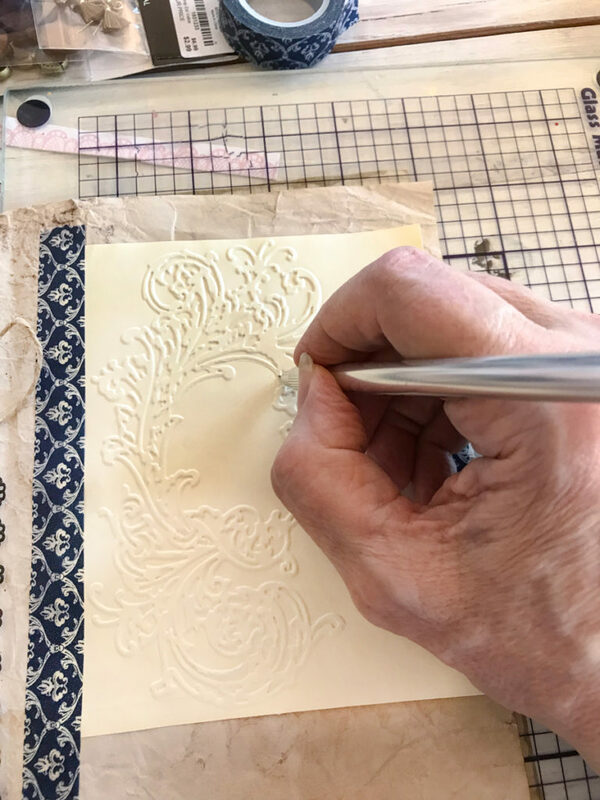 I used a tiny 1/4″ stenciling brush as shown below. PAGE 3 – Olivia (my traveler) heads to France via steam ship. 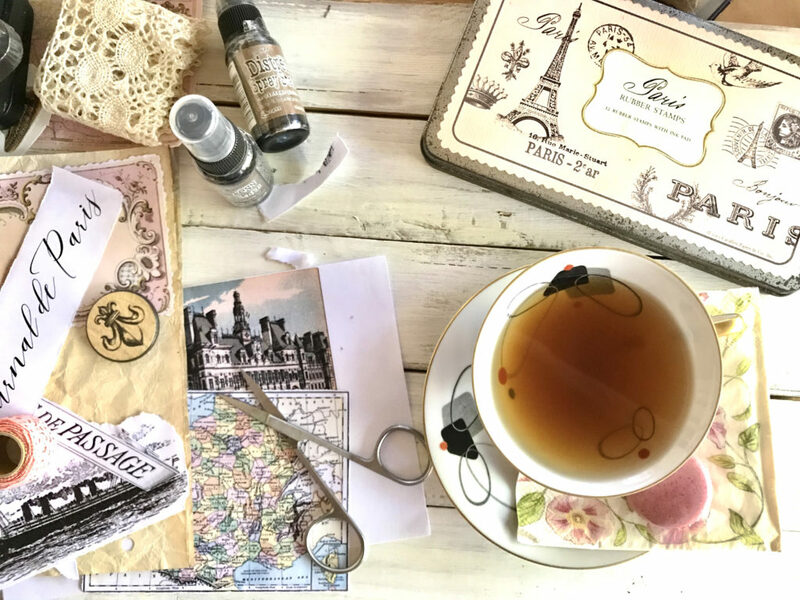 Her steamer trunk is packed full with beautiful clothes, sweet shoes, hats, gloves, corsets, and a leather bound journal for keeping her moments. 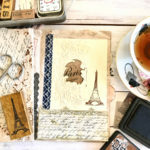 PAGES 4 & 5 – She carries a tiny calendar and buys a few French postcards on the ship to write her friends and family back home. Her best friend Anna accompanies her along with Anna’s Mother as a chaperone. The voyage was fun and there were several unattached gentlemen. The last night of the voyage, a yellow rose corsage arrived at her stateroom door from a ‘secret admirer.’ She danced the night away with several partners on her dance card. She dried the rose petals and ticked a few in a tiny envelope inside a lace doily she picked up from the dance. 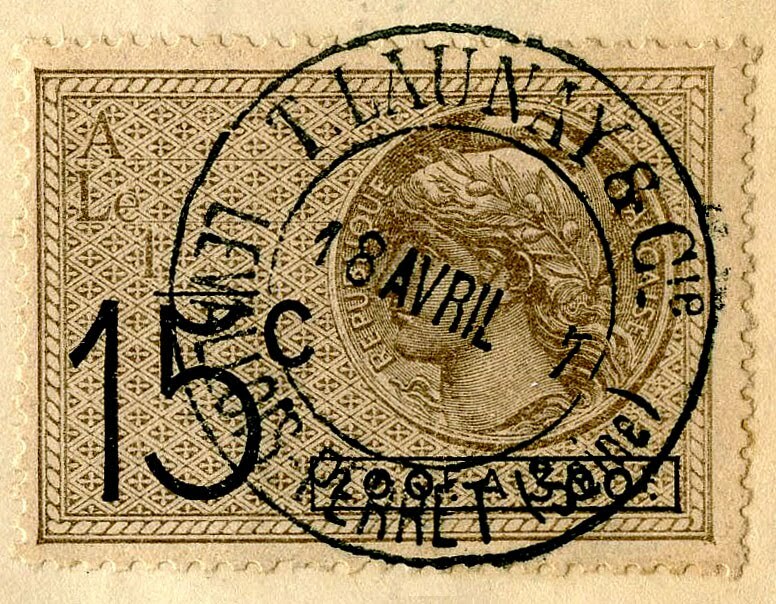 PAGE 6 – They rode a night train to Paris. She saved her ticket, a tea bag (we are pretending here) that is attached below the tag. 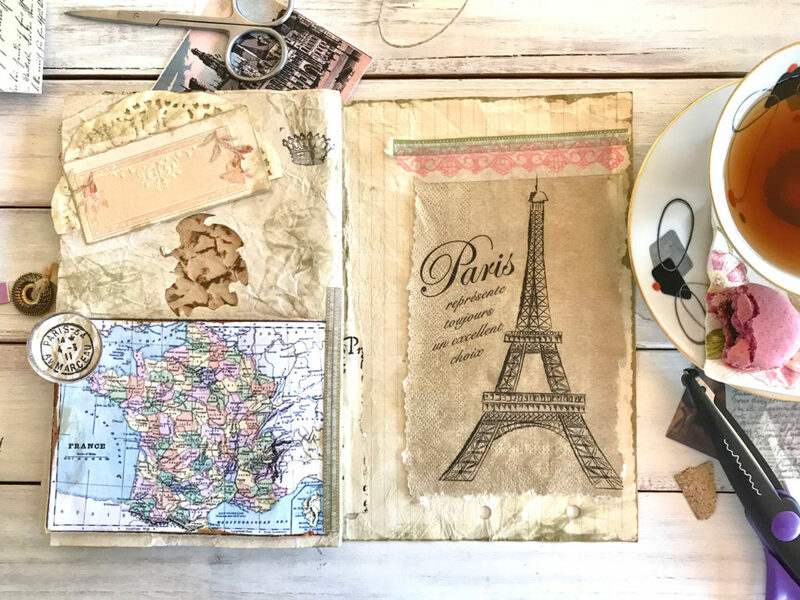 PAGE 11 – The girls are so looking forward to Paris! 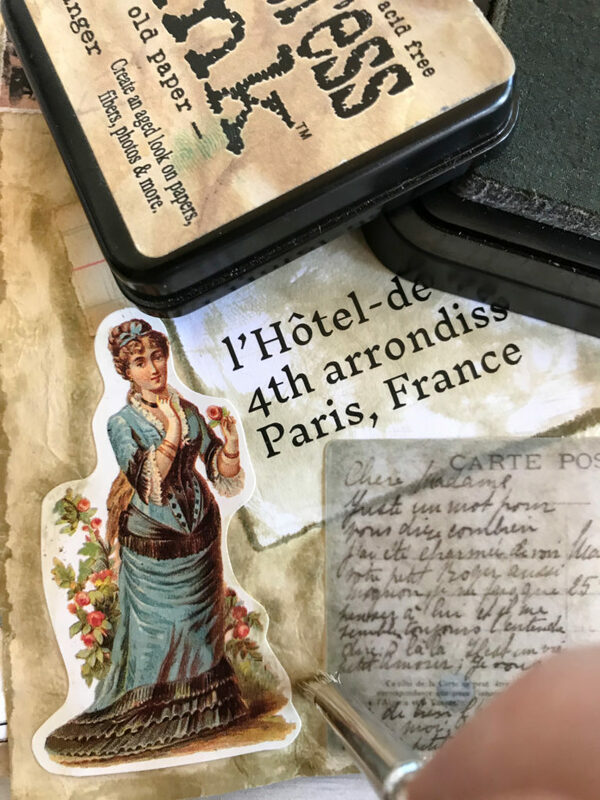 PAGE 14 – They chat about what they will wear to the hotel and she writes a few postcards in her best French vocabulary. Wowzers, that was a lot of technique, tips, and tricks to play and junk journal with. It should take you a few hours to complete the pages, depending on how fast you are. 🙂 You have a couple of weeks until we have our next tutorial, so have fun with your Junk Journal Page Layouts. I hope you learned some new tricks and are ready to get creative with us this Summer. Here is your assignment. Complete eight pages in your first signature using the above techniques. You will have four single pages, which will be Pages 3, 6, 11, and 14, and two, two-page spreads, which will be Pages 4, 5, 12, and 13. You can create your own using your imagination. Or you can duplicate mine. Remember there is NO ONE WAY or RIGHT WAY!!! Have fun! 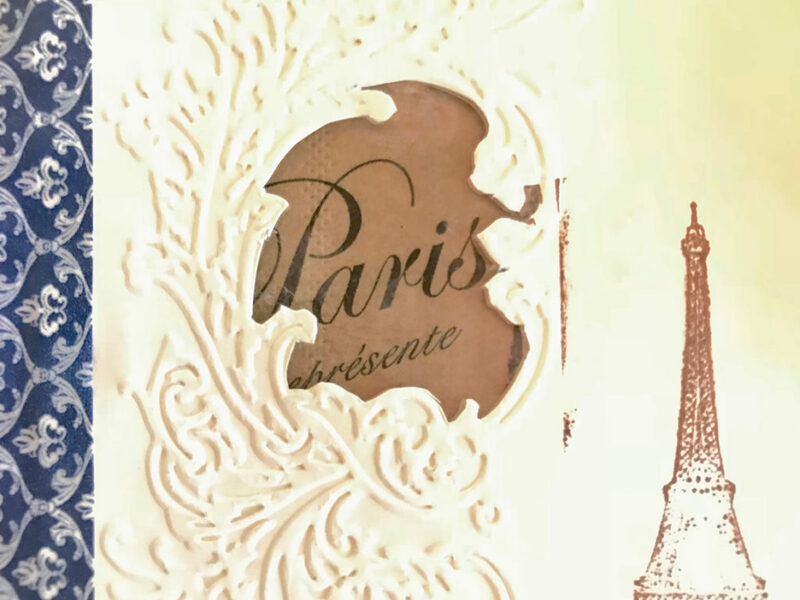 In the next tutorial we will take another creative exploration of France and The Graphics Fairy Archives. 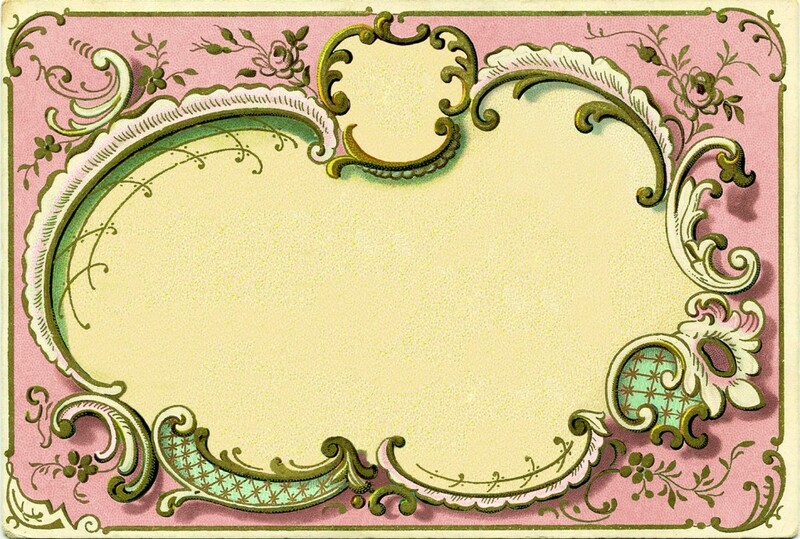 Please join me in Part 3 of this series HERE for Page Layouts Two. « 40 Best Free Bird Images!! Thank you so much for sharing all of the beautiful pages and photos! 🙂 now for me to get busy! Wow. So many great tips here. Love the style. Thank you! Glad you are joining us. Rebecca, do the page numbers you give reflect the folding of the large sheets? It seems as if they do since page 5 appears to be on a separate sheet from page 4. Yes Nancy, page 4 will be on a different piece of paper from page 5. 4 and 5 will be a spread in the final bound book. Talking about pages and spreads within a signature can be pretty difficult to translate into words!! I think I will create a diagram for the next tutorial to show exactly where everything is. Glad you are joining us this Summer. Rebecca, in order to be better organized, I took four of my folded sheets and stacked them by placing the second inside the first, the third inside the second, and the fourth inside the third. Then I put a small post-it on each of the 16 pages with the page number and, when known, a brief description like “steamship” or “train.” I’ve placed my completed images on the proper pages without gluing them down for now. Great ingenuity Nancy. Whatever works for you. I know creating a book can be confusing at first. I hope you will jump in and start to glue things down soon. No pressure. Happy creating. 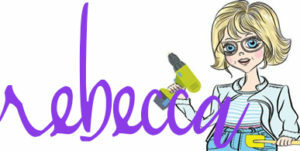 Rebecca, are we doing 6 or 8 pages? You demonstrated 8, but only listed 6 page size to complete as assignment. Just checking. Thanks for all the ideas. Great catch Joy!!! Thank you for keeping me on my toes! I forgot to include the single pages 6 and 11 (updated now). Talking about pages and spreads within a signature can be pretty difficult to translate into words!! Glad you are here. Great question Carla, you are correct. We will be creating those pages in the next tutorial!! This is so pretty and dreamy! Love the story. I, of course, love all things French😍Thank you for the wonderful tutorial. It will take me a while to complete the first set. Looking forward to the continuation of the journal pages and the lovely story! Just finished my first two page spread. It turned out really nice. Your instructions are very easy to follow, thanks. I am not very computer savy, so where would I enter a picture? Hi Linda. Awesome. I would love to see your work. You can submit images here: https://thegraphicsfairy.com/reader-submissions/ Or click the Submit tab in the menu bar.